Weather conditions: Not far off what was forecast, but still a bit disappointing considering how nice it was in HB this morning and also in Penrith. 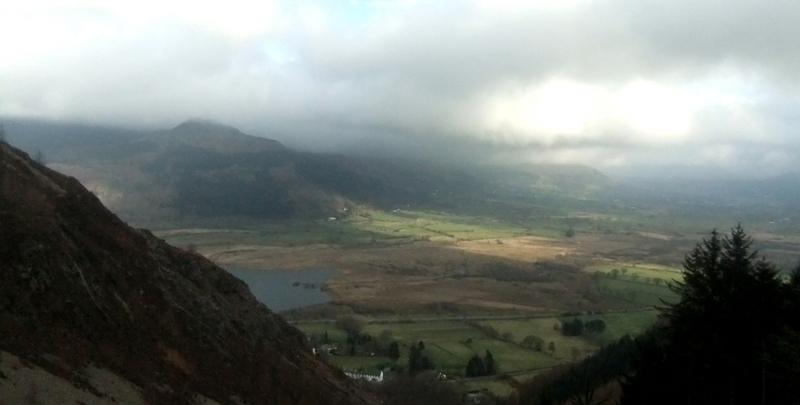 Mild enough, and dry, but low cloud obscured the first three summits of the day. Fells climbed: Graystones (1476’, no. 157), Broom Fell (1670’, no. 158), Lord’s Seat (1811’, no. 159), Barf (1536’, no. 160). View from Barf. 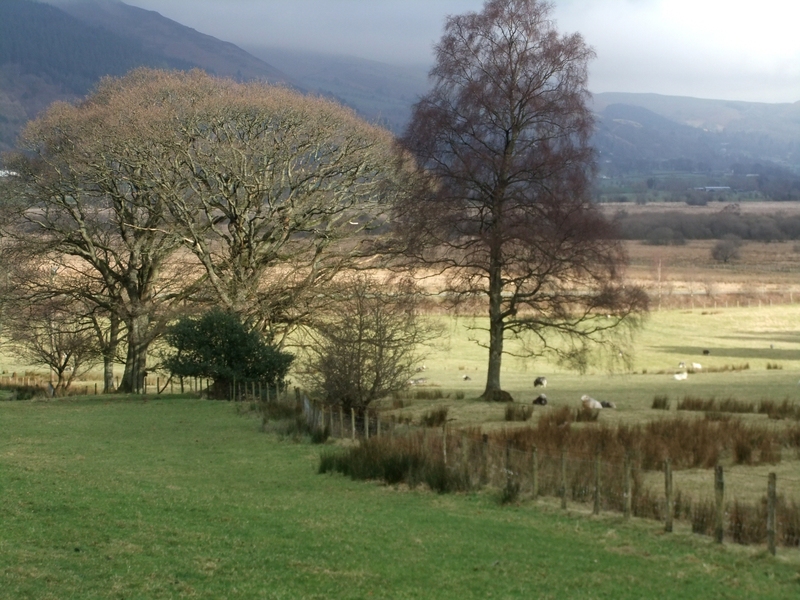 Dodd is the fell on the left, the water is the very head of Bassenthwaite Lake. Distance: 8.32 miles. (Had I not been in need of a beer the distance could have been 2 miles fewer). Start and end points: Started at Lambfoot, on the route of the X4/X5 Keswick – Penrith route at NY164303 (what’s this?). There is a bus stop here (with a post box on it). Finished in Braithwaite. I could have finished at the former Swan Hotel (NY220264) but just missed a bus and decided I would rather walk another 2 miles to Braithwaite than wait an hour by the side of the road for a bus. I like seeing the seasons change as I do these walks. 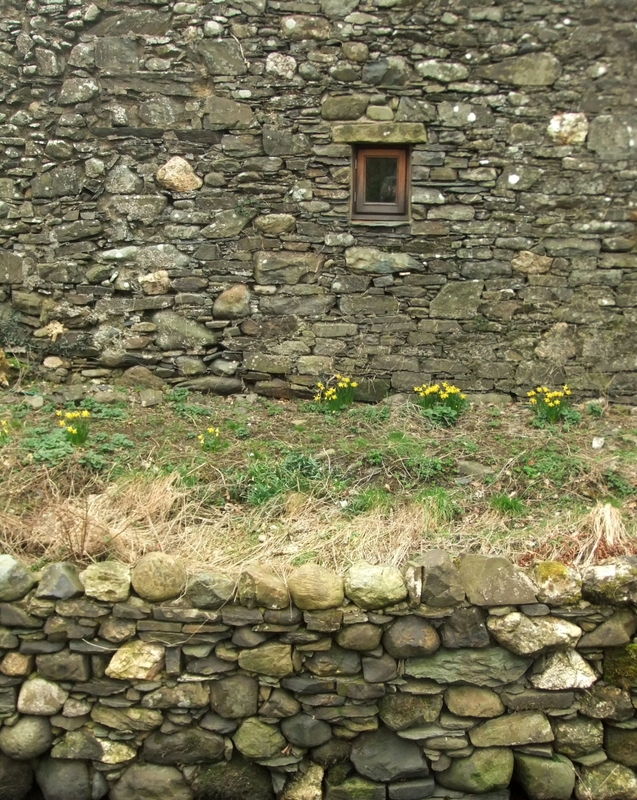 Last time was a full-on winter hike but today there were the first signs of spring, like these daffodils at Beck House Farm. Pub at end: Thornthwaite looks a very idyllic village to live or stay until one realises that it is dry. The Royal Oak in Braithwaite slaked my thirst again, thus becoming the first pub to terminate four of these walks. Route: This is not generally a hard walk: I did the Lambfoot – Swan Hotel section in 2 hours 40 minutes and the whole thing in about 3:15.. Especially considering that 4 fells are bagged the mileage and feet ascended are pretty mild – though there are some steep passages, especially on the descent from Barf, which has one section that those with vertigo should definitely avoid (sorry Pete). From Lambfoot take the lane from the bus stop down to the A66, cross it (with care! ), then go over the fields to the church. Then take the lane which is signposted Beck House (not a right of way for vehicles, but a public footpath) and follow it all the way to High Side Farm. At this point you come to a lane heading left and right. I turned left and then took the path (signposted Embleton High Common) at the top of the short slope – this follows the right bank of Tom Rudd Beck though it does not in the end seem to matter which side of the stream you follow. 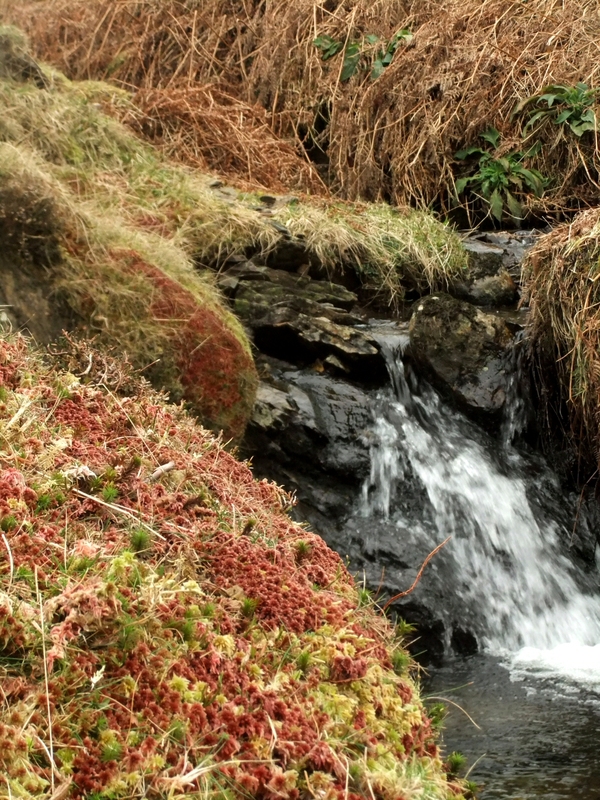 Once Tom Rudd Beck splits into three tributaries, make sure you follow the central one, as far as it goes, until the stream ends and the ground starts to steepen. Then just climb up to the apex of the big enclosure (NY176268), cross the fence and keep going up until the summit cairn of Graystones is visible to the right. 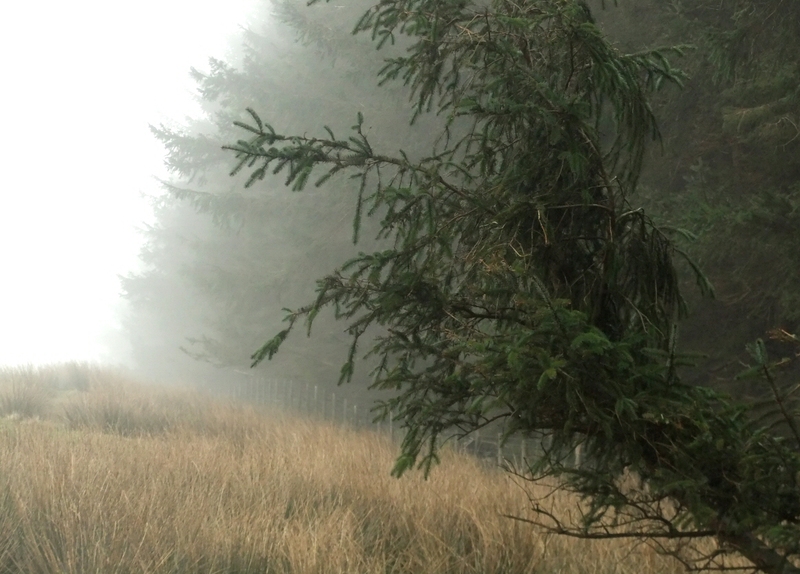 I did the ridge walk to Broom Fell in poor visibility but it seems easy enough – just stick to the top of the plantations and don’t enter the trees! The path is clear, if never distinct. If steep ground is encountered, the route is lost. The same applies as it heads for Lord’s Seat which was a featureless but easy stroll. At Lord’s Seat make sure you leave the summit by the path to the left, which leads to Barf (the right path goes to the Whinlatter Pass road).The clouds cleared for me at this point, but I would be wary of Barf in mist, having now seen it. There is very steep ground directly ahead of the summit so take care. 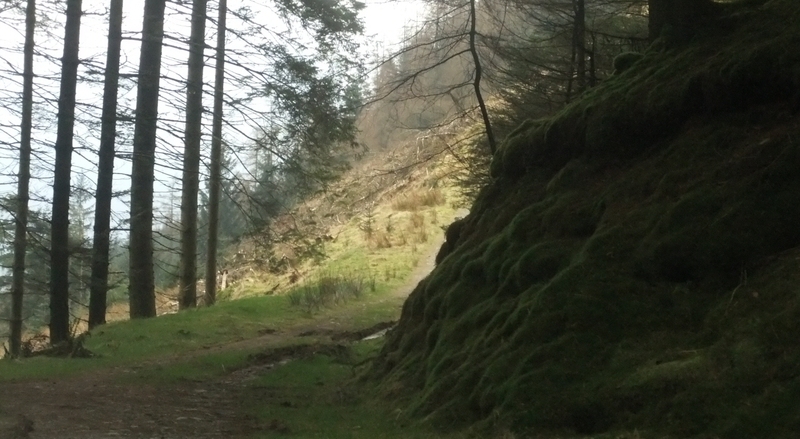 A direct descent to the road from Barf is clearly impossible, so don’t be tempted down that route – the way down instead leads into the plantations, along the first forest road for just a few yards, and then down the path signposted ‘21’ (this will refer to the map given out at the forest centre on Whinlatter Pass). This drops steeply down through the trees, following mostly the right (south) bank of Beckstones Gill until the very bottom when it switches sides to pass The Clerk (a tiny, painted natural obelisk) and reaches the main road at the former Swan Hotel. A bus can be caught from here, but the nearest alcohol is in Braithwaite, 2 miles further on to the right; the walk is easy because the road is flat and largely free of traffic, most of which goes along the dual carriageway these days. Photographic challenge commentary: Obviously, I am starting to run out of walks. There are now fewer than a quarter of the Wainwrights remaining for me to bag. I did have plans today to bag a couple from the Far Eastern Fells but that would have involved a 15-mile walk (and will have to do so, at some point), and I just didn’t feel like it. My legs feel rather middle-aged right now. But there are only so many alternatives left. This walk didn’t look exciting on paper, but it still had to be done. The forecast wasn’t great either, though a glorious morning in Hebden Bridge got my hopes up, and even in Penrith at 10am it was pretty decent – it’s actually quite pleasant to sit and have tea in the McDonalds’ at the station, which serves as a great sun trap and seems to usually have decent, chilled-out music playing. 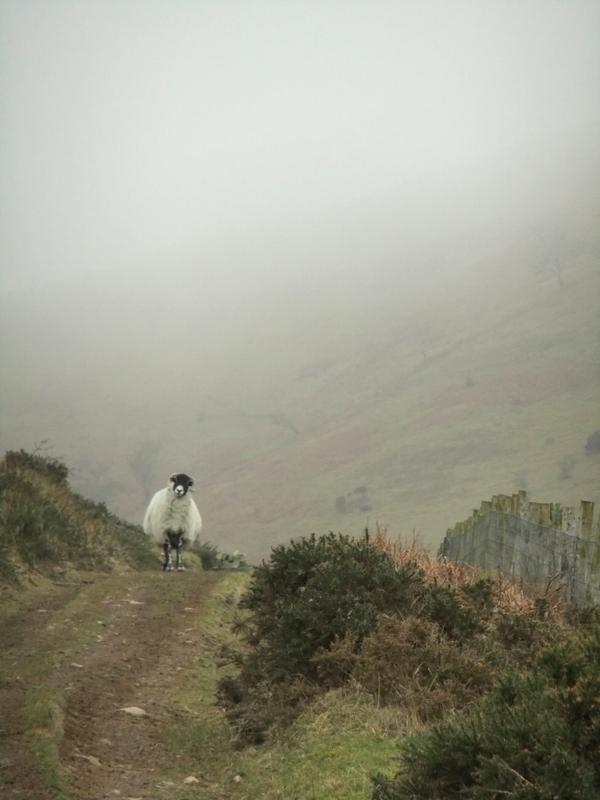 But once the bus headed for the fells to the west everything clouded over and in the end I made the right decision to go for the walk I did, as it was safe in the mist. It did mean, though, that I didn’t see much. The shapes of Graystones and Broom Fell remain complete mysteries to me as I neither saw them today nor have noticed (or photographed) them in the past. Actually I was surprised how many other walkers were around, once I was on the ridge; several groups loomed up from the mist between Graystones and Lord’s Seat, including the five elderly gentlemen who gave the picture of Broom Fell’s summit a bit of interest (but who later spoilt things by talking inanely in the Royal Oak about how standards of education have dropped terribly these days, haven’t they old chaps – guys, go read something like Barry Hines’ Kes or Sebastian Peake’s A Child of Bliss(in which he is literally tortured by his schoolmasters) for some damning indictments of educational practice in your era, and avoid the easy denigrations next time, OK?). 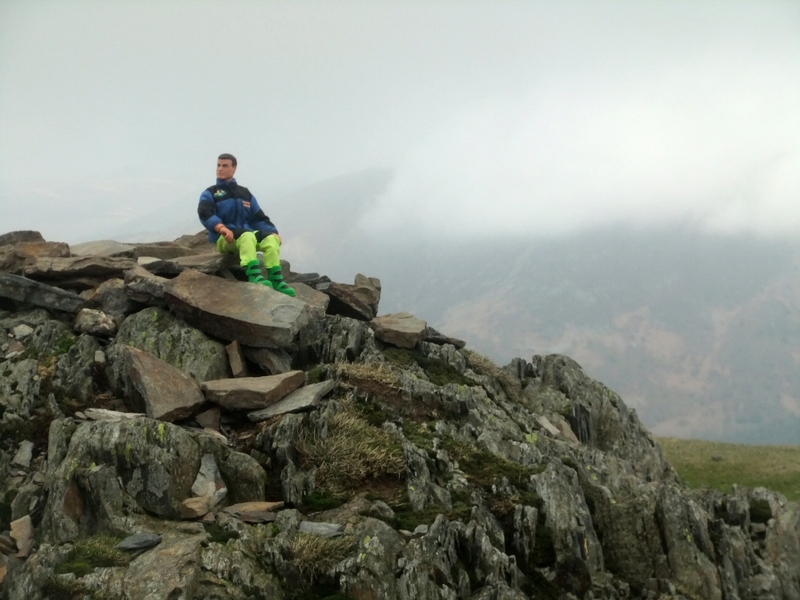 The Geordie couple on Barf endear themselves to me by placing an Action Man on the summit cairn and photographing it ‘for our grandson’ – a picture I use myself. The summit cairn of Barf (with Action Man). Barf is the real highlight of the day for a slew of reasons – the only one of the four I saw properly, the only one with a view (and a good one, even today), and it’s a rugged little beast with steep scree-covered slopes. And then there’s that very silly name (which even Chambers’ English Dictionary defines as meaning ‘to vomit’) that reaches its apotheosis in the best-named single feature in Lakeland, the white-painted slate pinnacle known as The Bishop of Barf, which is so good a title I think I might just die happy now. 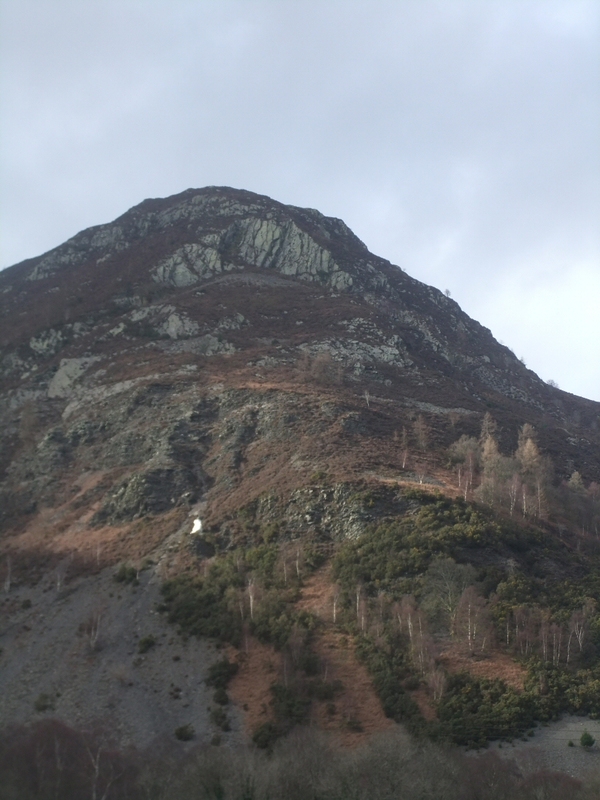 Though actually the Bishop looks like nothing so much as a dumpy snowman stuck halfway up the mountain. Barf, from below. White-painted Bishop of Barf (or Snowman of Barf) clearly visible. Yes, I liked Barf, and in the end the walk was interesting, if not dramatic. With no real light or views the photographic challenge became one of finding colour and composition; I think I did OK today (the best are on this and the fell pages, of course), but there were not going to be any classic shots. Anyway, 54 left now. I have also decided, finally and firmly, how I am going to bring this project to an end. First, I’ve ‘put aside’ 4 or 5 walks for next winter, so there won’t be any bagging of the Mell Fells, the fells round the Thirlmere Dam, Caudale Moor and a couple of others until we are into the 200s. As for the very end, I originally planned Scafell Pike would be last but that is not now going to be the case, mainly because I can now see I am going to finish in January. I will bag SP over the summer instead. The last walk is now going to be the easiest of all – Latrigg – so that I can end on a walk which everyone can join in if they want. More details nearer the time.